“Eat my dust boys!,” says 5’0″ Danica Patrick as she looks back at the following pack. Danica has proven herself a force to be reckoned with on the racetrack. This girl is conceivably the fastest woman race car driver in the world, and her light and fast petite frame are certainly a competitive advantage. No question, she’s hard to catch. Danica Patrick, US Racing Driver and certainly petite at maybe 5ft1? Her official site can’t decide, representing the driver as both 5’1″ and 5’2″. After seeing her in person and hearing from other sources, Danica is likely 5’0″. Regardless, she’s hot and PETITE! Danica Patrick was born March 25, 1982 in Wisconsin. Currently, she is married and lives in Arizona. More importantly, in her spare time she’s reportedly a shopaholic like the rest of us! According to sources, her favorite stores include BEBE and BCBG, and I have an idea why. These two particular designers are very petite friendly in their sizing. You can actually buy ready-to-wear clothes at BEBE and BCBG, generally with no tailors required. AP reports: The IndyCar star is in the final year of her contract with the Andretti-Green Racing team. She has been considering a jump to stock cars and recently toured several NASCAR shops in North Carolina. Chip Ganassi owns NASCAR and IndyCar teams. He said last week Patrick should stay in the open-wheel series because she’s close to making the last step toward a championship. Patrick says she’s not surprised by Ganassi’s position, but that won’t affect her decision. We want Danica to stay focused, and there’s no doubt in my mind this hot shot petite is set on winning. Every title for Danica is another leap forward for petite women, and she’s certainly a competitor to be reckoned with at this stage in her career. Amist all the distraction of corporate sponsorship demands and appearances, I am sure Danica still dreams of winning the Indy 500. That is, if she can even sleep after flying around a track at over 200MPH all day! That’s not all Danica dreams about. She clearly has a flare for fashion! If she were not racing Danica says, “I would love to get into the fashion world and design my own clothing line… shoes… bags. That’s what I would want to do after racing and it’s something I really love always!” I am confident about one thing: a Danica branded clothing and accessory line will be a fast selling one! Danica already has a foot in the door in the fashion business with a number of fashion related sponsorships, including Tissot watches. Danica also made two very popular appearances in Sports Illustrated’s “Swimsuit Issue.” There will no doubt be significant support for the petite star to develop her own clothing and fashion products, as she has successfully promoted so many other designers over the years. BellaPetite.com will continue covering the petite Indy queen for years to come. As always, we support professional petite women in all their endeavors and will continue to promote positive recognition in the marketplace. 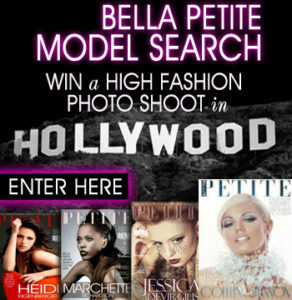 For all your petite fashion news and entertainment Bella Petite! Previous Halle Berry on her CAREER, LOVE LIFE & NEW DAUGHTER! SHAMU TOO! Wow, great stuff here! I love this website. Finally, something that’s really good for petite women to read about! I want read more. Looking forward to this becoming the coolest place on the internet! I have you bookmarked.